Christians have played a vital role in the history of Pittsburgh as community leaders, activists, athletes and more. Their ministries have inspired many worshipers and improved the community. Leading Pirates, Steelers and Penguins who have powerfully promoted Christianity here include Andrew McCutchen, Clint Hurdle, Troy Polamalu, Mike Tomlin and Dan Bylsma. A diversity of parachurch organizations and congregations, from Baptist to Presbyterian and Catholic to nondenominational, have shaped and advanced the faith. 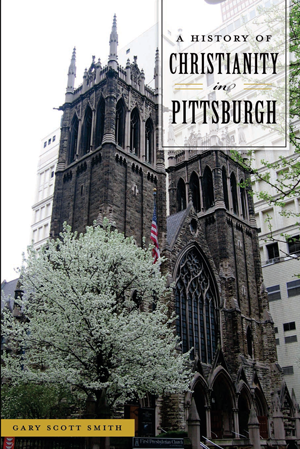 Gary Scott Smith tells the exciting story of their quest, as Episcopal rector Samuel Shoemaker put it, "to make Pittsburgh as famous for God as for steel." For thirty-nine years, Gary Scott Smith taught at Grove City College, where he chaired the History Department and coordinated the Humanities Core. He earned his MDiv at Gordon-Conwell Theological Seminary and his PhD in history at Johns Hopkins University. He received Grove City College’s inaugural Professor of the Year award in 2000, and the next year, he was named Pennsylvania Professor of the Year by the Carnegie Foundation for the Advancement of Teaching and the Council for Advancement and Support of Education. He is the author or editor of thirteen books, including Faith and the Presidency: From George Washington to George W. Bush (Oxford University Press, 2006), Heaven in the American Imagination (Oxford University Press, 2011), Religion in the Oval Office: The Religious Lives of American Presidents (Oxford University Press, 2015) and Suffer the Children: What We Can Do to Improve the Lives of the World’s Impoverished Children (Cascade Books, 2017). Smith is also an ordained minister in the PCUSA and currently is the co-director of the mission program and a parish associate at Saint Andrews-Covenant Presbyterian Church in Wilmington.